Most people would advise against sticking sharp metal things in your mouth, but then dentists come at you with a noisy metal drill and that’s supposed to be normal? 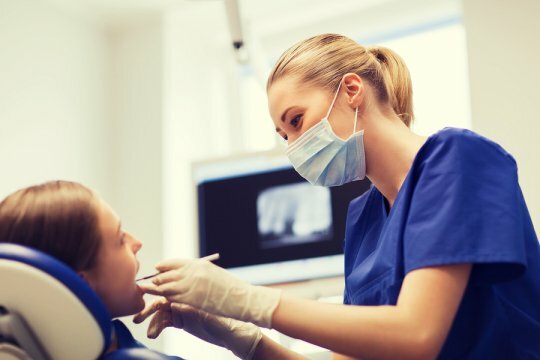 No wonder people are afraid of going to the dentist when many dental procedures require anesthesia injections, stitches, and lots of recovery time. Fortunately, there is a new game in town that is helping highly skilled dentists in St. Louis take the “Ouch!” out of dental visits. Laser dentistry is a fast and effective method that uses heat and light to perform a wide variety of dental procedures. Most importantly, laser dentistry is virtually pain-free! A laser dental treatment works by honing an intense beam of light energy to perform precise dental procedures. They are easy to control and allow dentists to painlessly cut or vaporize tissue on contact, eliminate decay in teeth, and remove soft tissue from gums. Blood loss is minimized because the high-energy light beam cauterizes as it works, which drastically reduces recovery times and the need for over-the-counter pain killers. Lasers also prevent bacterial infections by sterilizing the area and minimizing damage to the surrounding tissues. 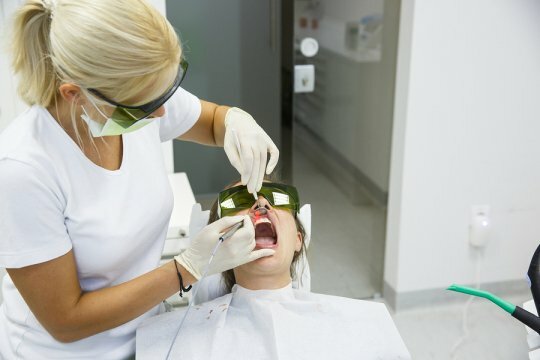 What makes laser dentistry painless? If just the thought of a scalpel going near your mouth gives you the shivers, then laser dentistry is your new best friend. This high-energy light technology is vastly less invasive than traditional methods. It eliminates the use of drills and scalpels in many dental procedures, which also reduces the need for anesthesia. Even biopsies and cavity fillings are made painless with laser dentistry! All procedures are performed with pinpoint accuracy to protect the surrounding tissues, and there are no stitches to care for afterwards. As an added bonus, lasers sterilize as they go, which reduces the risk of painful bacterial infections. As the number one selling hard and soft tissue laser in the industry, the Solea laser is the epitome of painless dentistry. If you are an anxious dental patient, you may lean on anesthesia to get you through a dental visit, even if you hate the groggy or numb feeling you are left with after the fact. But with the Solea laser, most dental patients skip anesthesia all together because they just don’t need it! Solea is the first CO 2 laser that uses a unique wavelength guided by sophisticated computer controls to vaporize tissue and enamel from any angle with amazing speed and accuracy. With no pain-triggering vibrations and anesthesia-free results, you can now undergo several hard and soft tissue procedures in one comfortable dental visit. Painless dentistry really is possible with the revolutionary laser dental treatments provided by West County Dental . Our exceptional team is dedicated to making your time in the chair comfortable, and we are always happy to answer your questions or address your concerns to ensure the absolute best dental experience.